Do I need to re-register to vote in the EU referendum? Anyone who was registered to vote (or applied to register) before the 18 April 2016 deadline for the elections taking place across the UK on 5 May will also be registered to vote at the EU referendum. You do not need to re-register. If your circumstances change, for example you move home between now and the EU referendum registration deadline on 7 June, then you will need to re-register at your new property. You can register to vote online anytime at gov.uk/register-to-vote. The referendum on the United Kingdom’s membership of the European Union is being held on Thursday 23 June 2016. Visit the About My Vote website for further information about voting at the EU referendum. 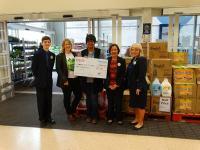 Spelthorne Council took part in Tesco’s Bags of Help initiative at the end of March and raised funds for improvements to the Commercial Road Allotments in Staines-upon-Thames. The scheme allows Tesco customers to use tokens given to them at the till to vote for their favourite local project and decide how grants of £12,000, £10,000 and £8,000 – all raised from the 5p bag charge – will be allocated. Tesco Extra stores in Ashford and Sunbury took part in the scheme and after a week of voting it was announced that Spelthorne Council received £8000 for the allotment project. Two other local projects run by Town Farm Primary and Riverbridge Primary School received £12,000 and £10,000 respectively. Lord-Lieutenant of Surrey visits Spelthorne! 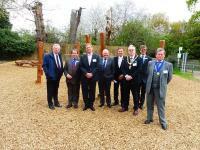 Mr Michael More-Molyneux, Her Majesty’s Lord-Lieutenant of Surrey, visited Spelthorne on Tuesday 26 April. Accompanied by the Council’s Chief Executive, Roberto Tambini and Mayor of Spelthorne, Cllr Francis, Mr More-Molyneux was taken on a tour which covered a number of areas including the local town centres, Stanwell New Start, Sunbury Park, Shepperton Studios and London Irish Training Ground. HM The Queen appoints a Lord-Lieutenant to be her personal representative in each county of the United Kingdom. In Surrey, the Lord-Lieutenant follows the example of HM The Queen by seeking to promote a good atmosphere and spirit of co-operation. He does this by the encouragement he gives to voluntary service and to benevolent organisations, and by the interest he takes in the commercial and social life of the county. The role, like that of the Monarch’s, is strictly apolitical. Calling all Landlords in Spelthorne! Landlords from all over the Borough got together at an event hosted by Spelthorne Council on 26 April at The Orangery at Shepperton Studios. They had an opportunity to network and listen to guest speakers on subjects such as recent legislative requirements and changes in tax law which affect landlords. The event was very well attended with excellent feedback on how useful it had been. As a result, the Council will aim to host regular Landlord Forums to encourage networking and allow us to get to know our landlords better. The Council is looking to introduce a Rent Guarantee Scheme to encourage landlords to rent their properties to tenants recommended by the Council. The scheme was launched for consultation at the event and, following feedback, will be launched later in the summer. Highlights of the scheme include the Council guaranteeing to pay the landlord rent directly for an initial period of 2 years at the prevailing market rent, free tenancy agreements and a security bond for the lifetime of the tenancy. We are particularly looking for 2 bed properties. If you are a landlord and are interested in what we are proposing, please contact Sam King on 07885 977487 or by email at s.king@spelthorne.gov.uk, for more details about the proposed scheme. We would love to hear from you. In conjunction with the forum, the Council is currently surveying private landlords to gather information to better understand their circumstances and how we can work more closely together. If you are a landlord and are interested in completing the survey please follow the link below. A £100 John Lewis voucher will be given to one lucky winner who completes the survey. The results of the survey will be published on the private landlord pages on the Council’s website by the end of May. Woking & Sam Beare Hospice’s New Build Appeal mascot, Hope the Heart, commenced her ‘Love your Hospice Tour’ and meet with staff and volunteers at the Ashford outlet. With her tour of the geographic area, Hope aims to educate members of the public about their local hospice and the importance of the New Build Appeal. No matter whether they are based on site and helping patients who come on to the ward, or whether they look after patients in their own homes, hospice staff would not be able to operate anywhere near as effectively as they do without a suitable base. The hospices buildings are therefore considered to be at the heart of all the fantastic work that Woking & Sam Beare Hospices do. It is hoped that people who may not otherwise consider donating to Woking & Sam Beare Hospices will be made aware that the charities need their support in order to build a better future, which will allow even more patients across Surrey to access vital services when they need it most. 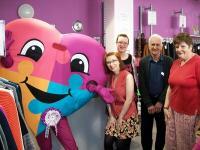 Appeal mascot, Hope, made her debut at the launch of the New Build Appeal in February. She has been working hard ever since to help raise awareness of the campaign and inspire donations to help raise the remaining £3.4million needed to complete the new, state-of-the-art in patient unit in Woking and the subsequent redevelopment of Sam Beare Hospice in Weybridge. The four colourful segments of the heart represent the four areas of care that the Hospice offer: On the Ward, In the Home, Family Support and Wellbeing. All of these areas of care will be improved when the new hospice sites are opened in 2017. To find out more about the New Build Appeal, or to make a donation, visit www.wsbhospices.co.uk/NewBuild.